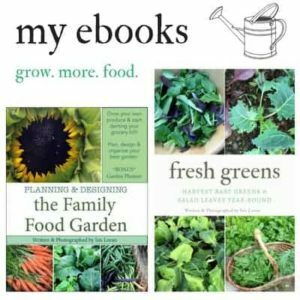 Herb spirals offer a very beautiful feature in your garden, and it’s a wonderful way to have all your culinary or medical herbs in one place. What makes herb spirals unique is their design to maximize space while creating different little micro climates which create extra heat or shade for different herb preferences. 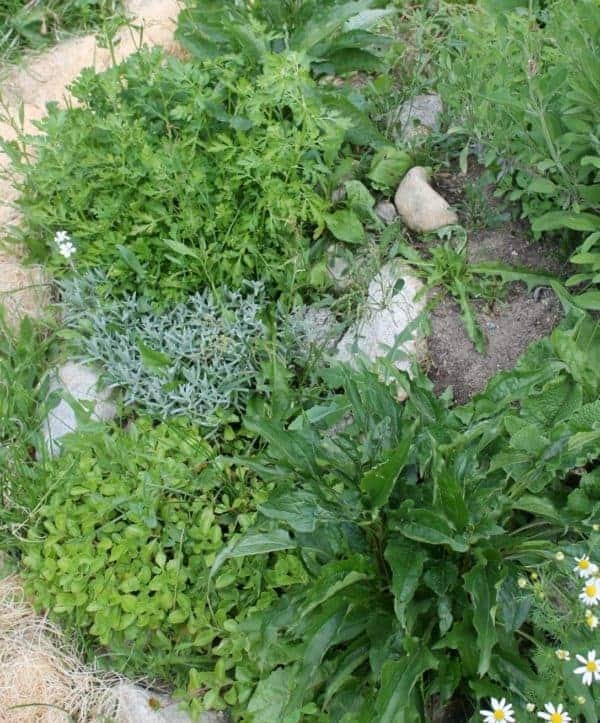 Many herbs are of Mediterranean origin and prefer sandy soil and dry conditions. 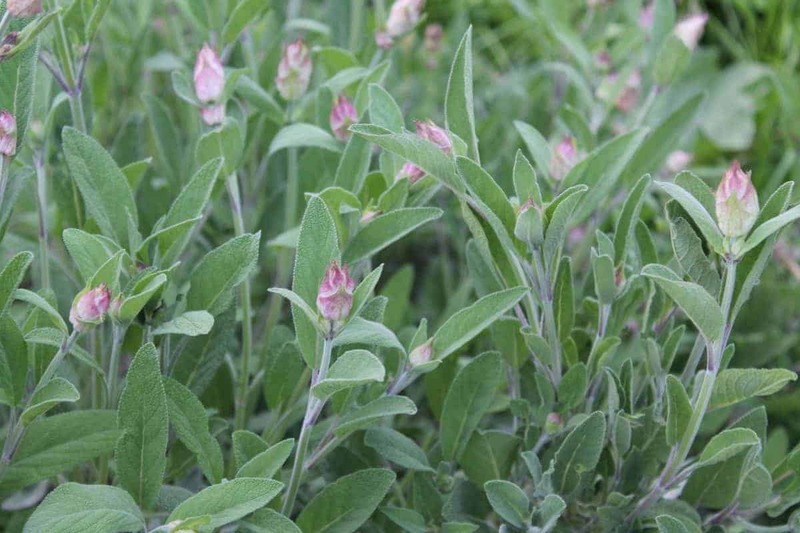 These herbs include oregano, woody herbs like thyme or rosemary. Other herbs prefer cooler tempers, a little shade and moist soil like cilantro or mints. It’s important to remember the microclimates in your herb spiral. We made the rookie mistake of planting mint, which is invasive and not a good idea (this was our 2nd year gardening!). 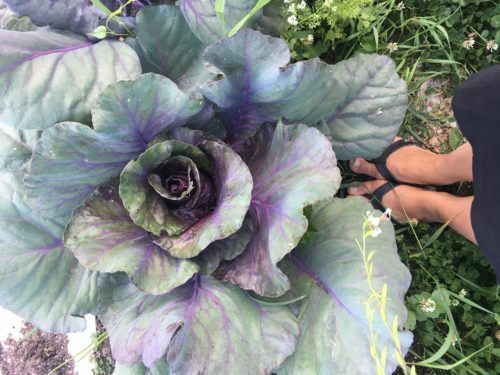 Here are some tips when choosing herbs for your kitchen herb garden, or you could add some shorter medicinal herbs, however remember that many medicinal herbs grow very tall (some 6-10 feet) so really pay attention to the size. Rosemary might not be the best choice for cooler climates as they need to a zone 9 for year-round growing. 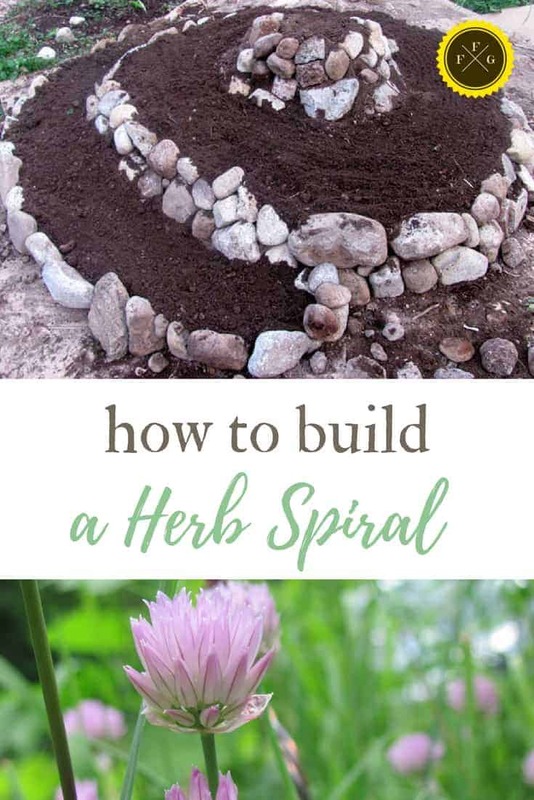 Here are some visual step-by-step instructions for building a herb spiral. We used rocks, but you can also use bricks. We first cleared out the weeds and laid down cardboard with enough overlap to suppress weeds in the area surrounding of the herb spiral. Some people wet the cardboard as it breaks down faster but we didn’t bother. 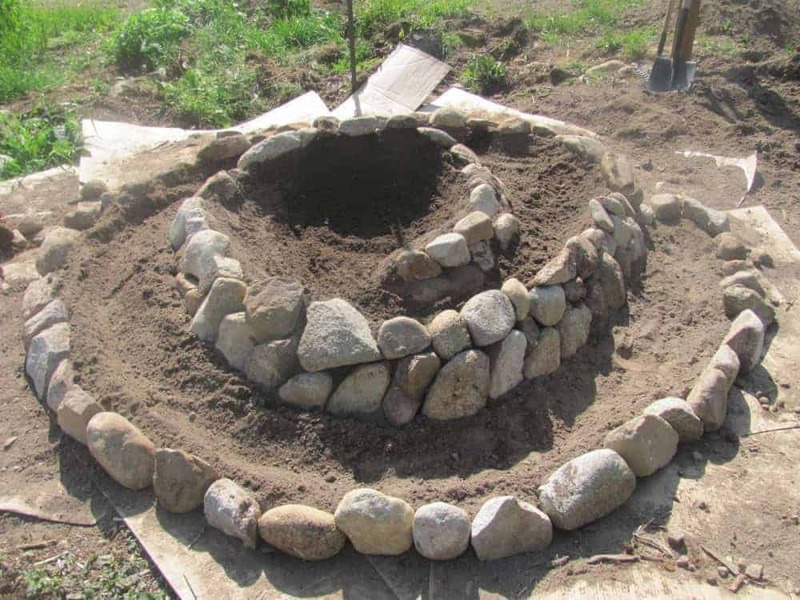 Then you want to use rocks (or some people use bricks) and start making your shape by constructing the outer wall first. 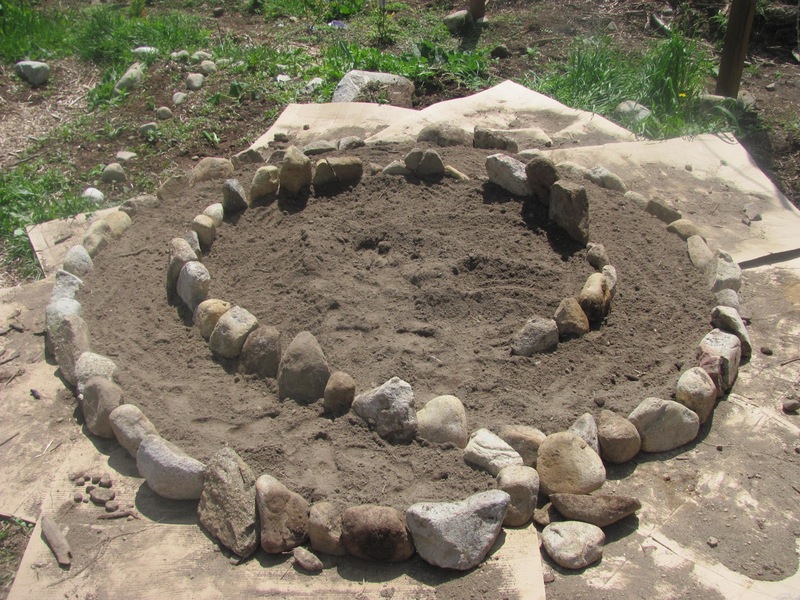 We made ours with a 1 meter distance from the centre of the spiral to the outer wall. Some people also choose to just pile a huge mound of soil and then wedge the rocks into it. Then we made the outline shape of the spiral using the rocks and adjusted it if we needed to while filling it in with soil as we went. We chose slightly sandier soil as were growing a lot of Mediterranean herbs in the top layers. 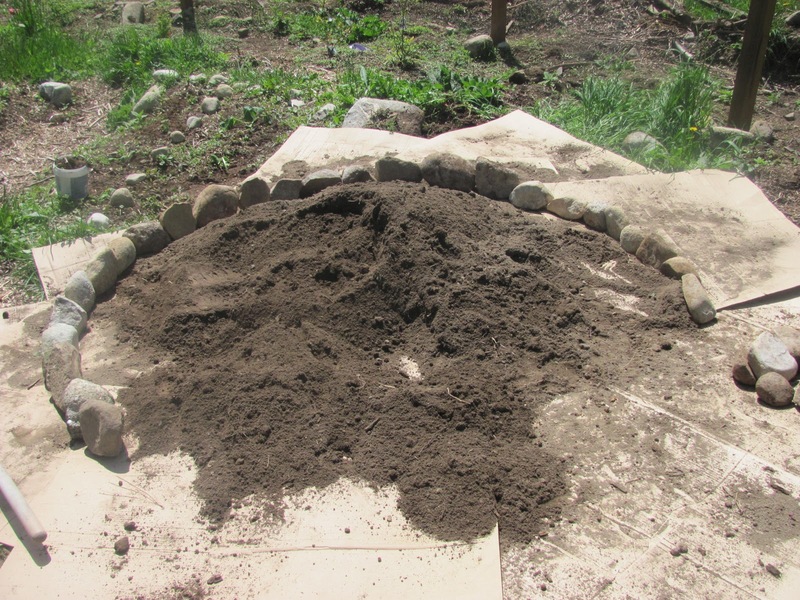 Once you have the first layer of rocks you can add more dirt and then wedge more rocks to build a double rock wall. Keep on filling the spiral with dirt until it’s level with the rocks. 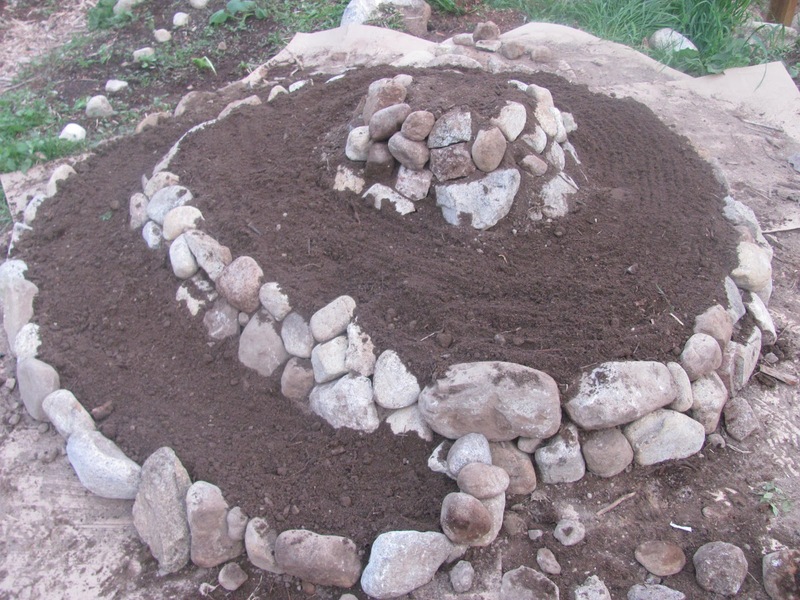 The uppermost top has a 3 layered rock wall to give the herb spiral more height. 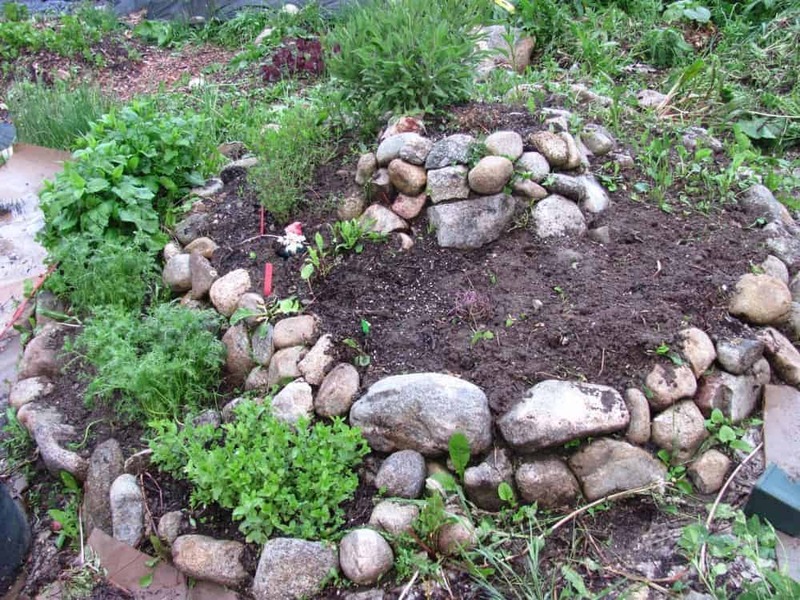 Here’s what the herb spiral looked like the 2nd year. Not all the herbs were perennials. 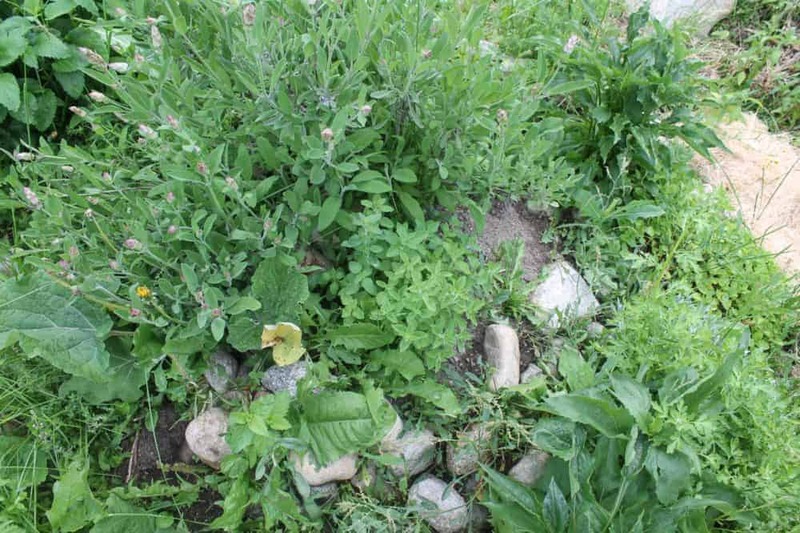 Some of them self-sowed like the chamomile (and even ended up spilling all over the place outside the herb spiral). I’ve direct seed annual herbs like basil & cinnamon basil, dill and cilantro in the ‘blanks’ that you see here. As I mentioned already, you’re not suppose to plant mint in a herb spiral as it’s very invasive. I did it because it’s close to the fence and I wanted it to spread in that area instead of wild weeds. Realistically though, it’s not the best herb for a herb spiral. 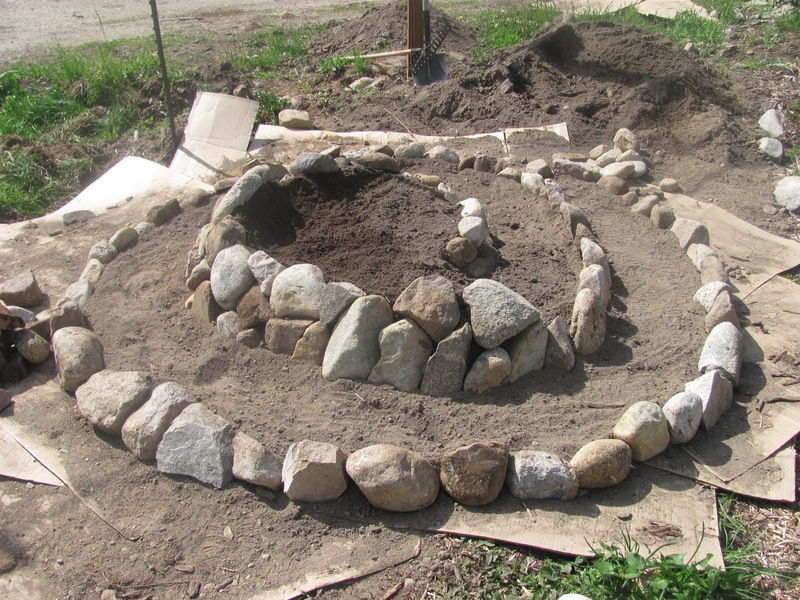 I’ve discussed the pros and cons of using rocks to build garden beds in this post. Because most herb spirals are built with rocks, tiny weed seeds can fall into the cracks and germinate making it hard to weed. 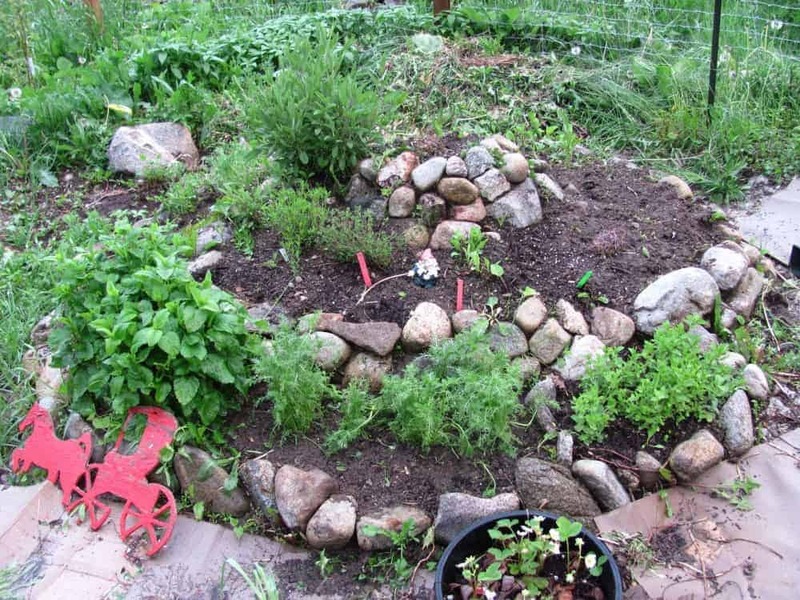 Here are some photos of our herb spiral 3 years later. 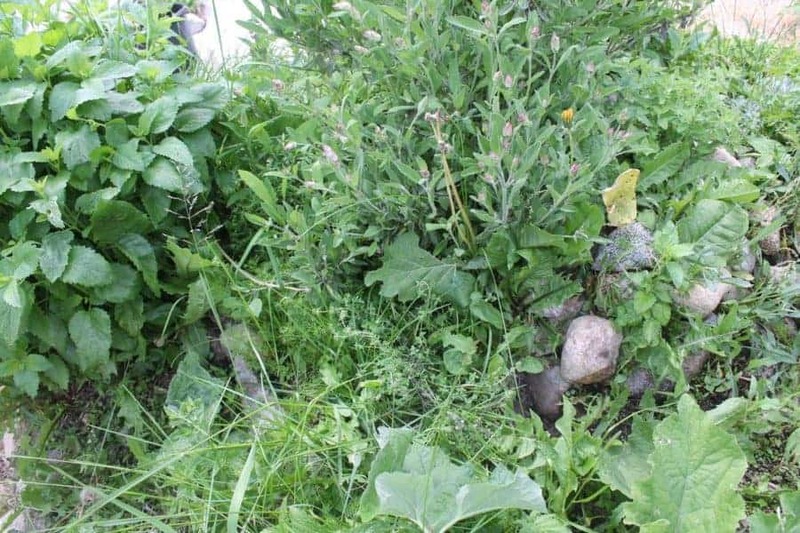 I will say that we lived on a mountainside where the forest was growing into our garden, so weed battles were epic and frequently took over our garden. This was a popular DIY project from my old site Little Mountain Haven. 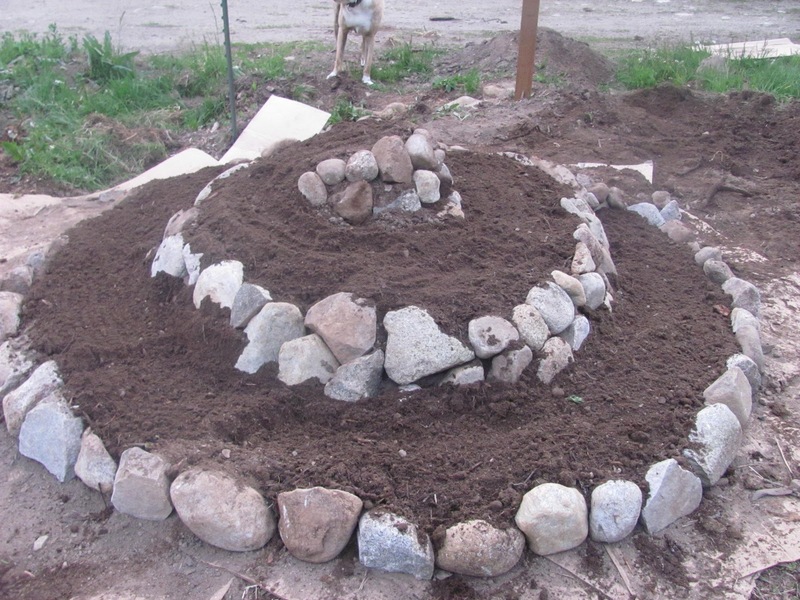 We plan on building another herb spiral in the future. At the end of this post I also show you what the herb spiral looked like in the 2nd and 3rd year. Many DIY posts fail to show you the long term results, only the pretty first year! I share the mistake we made. 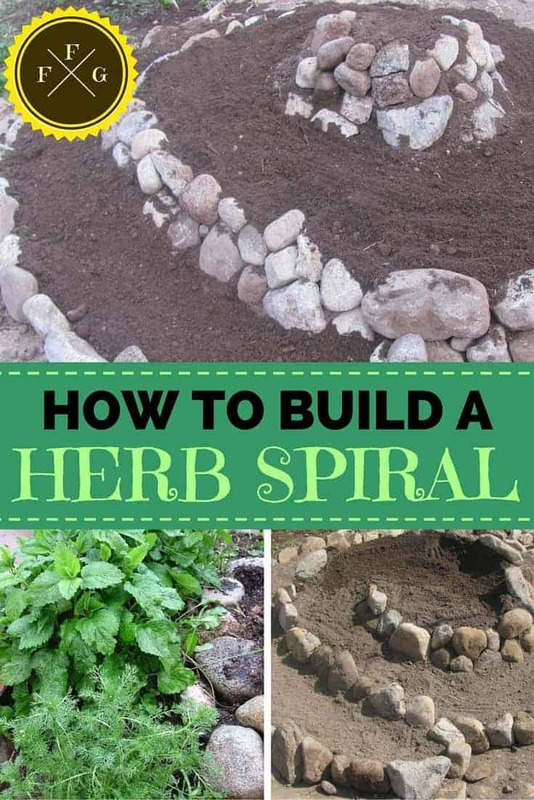 What herbs did you end up planting where in the spiral? At first we had a rosemary at the top but we changed it to oregano. 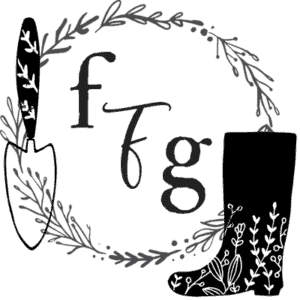 Sage, thyme, winter savoury, echinacea, feverfew, lemon balm (too invasive), chamomille (self-sowed out of the herb spiral). I have a few blanks that I was planting basil in. 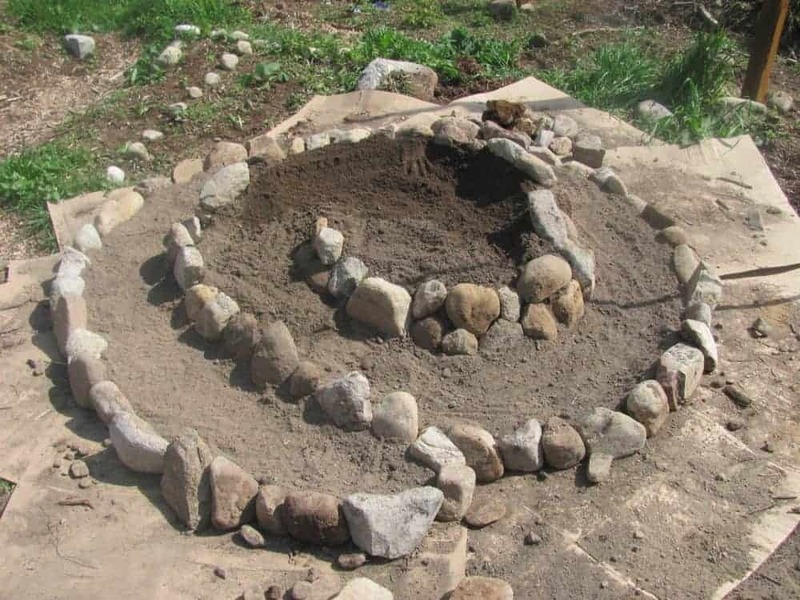 I love this idea, but is there much maintenance to the actual rock spiral? We live in Pennsylvania and foresee having to redo the spiral every spring due to the winter frost. I feel that weeding in between the rocks is the most challenging part. The frosts are ok for many of the herbs, it depends on what you plant. We get months of snow and many hard frosts here. I live in zone 8a and my rosemary is evergreen. 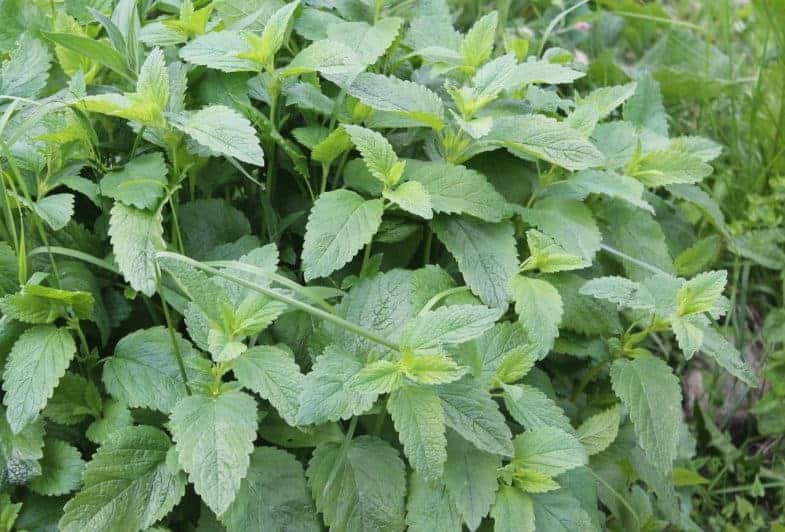 Lemon balm Is in the mint family!